Klax, or “Klacksing,” as it was originally known, began on the boardwalks of sea-side resort towns in New Jersey, and quickly spread up and down the Eastern Seaboard. Although some trace its roots back to the Colonial days, it is far more likely that it started during the heady days of the “Gilded Age,” roughly 1870 - 1899. Gameplay was remarkably similar to the way the game is played today. A conveyor belt (the first models were cranked by young urchins, but these were quickly replaced by steam or electric engines) carried large wooden tiles towards a depression in the ground, called a well. The tiles were placed on the conveyor behind a curtain. Because the tiles were arranged in a well, the person placing the tiles couldn’t see what patterns were being chosen, and so what colors came down the conveyor was theoretically random. The gentleman (ladies were not allowed to play) who was “klacksing” then arranged the tiles, as we do today, in vertical or horizontal rows of like colors (diagonals were not introduced until the mid-1930s), under the watchful eye of the game minder, who made sure that the players did not surreptitiously rearrange tiles. In the early days, players were limited to the tiles they could hold in their hands, and if three tiles dropped off the conveyor, the game was over. If the player achieved an objective, (getting 4 “klackses” or 3 in a row, say) that was previously agreed upon between him and the game minder, he won a small prize, like a Kewpie Doll. Better prizes were awarded for more difficult arrangements. Although Klacksing was a popular resort pastime, it really took off during the Roaring 20s, when the “shoe” was introduced. The shoe was a device that held up to five tiles–no longer were players limited to the tiles they held in their hand. The shoe was also a convenient place to stash contraband bottles of beer if the Police happened by. The word for the practice, “shoeing”, quickly became slang for hiding alcohol, and Klax (as it was re-christened in Pepe Morano’s famous song of the era), which was once considering a sporting game for proper Victorian gentlemen, quickly became associated with pool halls, bootlegging, and fast living. Even the Great Depression couldn’t dull enthusiasm for Klax, in fact, with the diagonal, Klax became more popular, and the subject of more decency crusades aiming to eliminate it. 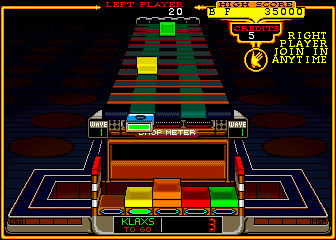 The introduction of the diagonal Klax was made possible when fully electro-mechanical versions of the game, which used magnetized tiles and mercury switches to sense klaxes, were shipped from the arcade makers in Chicago across the country. It certainly didn’t help the game’s reputation to have most versions stamped with the name of the Windy City, which was then associated with Al Capone and all things criminal. Despite the decency crusader’s efforts, it eventually took a war to quell the popularity of Klax. Because the electromechanical game used so much precious metal, and because the game took so much time away from boys who were soon to be occupied by more treacherous tasks, F.D.R. banned the game in an executive order dated February 2nd, 1942. “It is the war, and there is no time for Klax,” declared FDR in a public statement, April 3rd, 1942. With most players–and operators–destined for the Army, there was no public outcry about the ban, and after the war, the game was quickly forgotten in the wave of post-war technological achievements like television and Skee-Ball. A few newspaper columnists noted Klax’s passing, but the public at large, which was so taken with the game just a few years ago, seemed to completely forget the game, just as many pre-war traditions were lost. The game disappeared so rapidly from the national consciousness that the ban on Klax wasn’t even officially lifted until September 8th, 1978, by Jimmy Carter–the last of the World War II executive orders to be repealed. Although a few electro-mechanical Klax games exist in collectors’ hands, the game was largely forgotten until 1989 when programmers and designers at Atari Games resurrected the concept for a radical new puzzle game. The intro screen, “It is the 90’s and there is time for Klax”, recalled FDR’s famous pronouncement. Today, it is the Millennium, and thanks to the power of Nintendo’s Game Boy, you can now take Klax with you anywhere you go!